This is development with Indian characteristics, according to India’s Chief Economic Advisor Arvind Subramanian, who visited CGD for a wide-ranging conversation on the emerging big ideas that he has been instrumental in shaping during his two and a half years in his current role. The discussion was fascinating to say the least, giving us a window into the minds of India’s policymakers as they grapple with the challenges of building a modern infrastructure, implementing the Goods and Service Tax reform, and creating jobs for a million young people entering the workforce every month: all with the objective of reducing poverty and improving the delivery of basic services and subsidies. The ultimate message is a hopeful one. With strong political will, better cooperation with states, and by harnessing the power of digital revolution, poverty can be substantially reduced—if not eliminated entirely—within a generation. As India moves towards a more effective governance model based on digital id and payment systems, it expects its citizens to be active participants in the effort. And finally, the new compact also demands greater honesty and compliance in payment of taxes, without which India will not be able to make the transition to a modern economy. Demonetization was a signal that the government has the will and the capacity to disrupt entrenched vested interests, whatever the short-term political economy cost may be. Some of these changes are already visible. 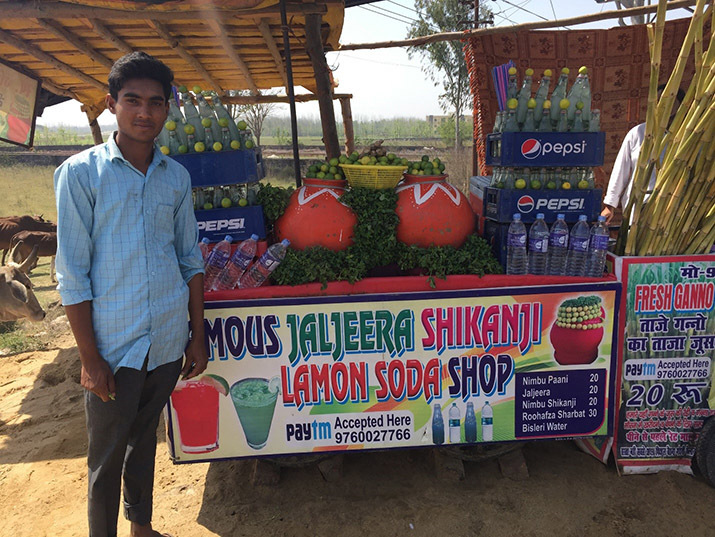 On a recent visit to India, I came across a sugarcane juice vendor on the side of a highway near Delhi who accepted payments through a digital wallet company. His motivation is clearly economic—most of the people who stopped by his shop are car owning city dwellers who have migrated to mobile wallets following demonetization. Data released by the Indian central bank does indeed indicate that demonetization is leading to more digitization, as my colleagues Michael Pisa, Divyanshi Wadhwa, and I wrote in a recent CGD blog post. And what is seen as a shot in the arm of the government, a recent Supreme Court ruling allowed it to make Aadhaar mandatory for filing taxes and opening bank accounts. While the jury is still out on how pervasive the use of Aadhaar should be for targeting beneficiaries for welfare payments, it seems that the digital train has left the station and there is no turning back. But the idea that caught most attention was Dr. Subramanian’s views on universal basic income, or UBI. As my colleague Todd Moss wrote in a recent blog post, India is nearly done building the plumbing to enable such a system by connecting Aadhaar to individual bank accounts. It’s already replaced LPG gas canister subsidies with cash, a program that has 150 million beneficiaries and is the now the world’s largest cash transfer program. So could India take this example to its logical conclusion and replace all welfare benefits with UBI? Dr. Subramanian framed the UBI debate in three categories. One driven by what he called “Silicon Valley guilt”—that automation is reducing job opportunities—the second driven by donors such as the GiveDirectly’s bold 10-year $30 million experiment in Kenya. The third category, which has been proposed in this year’s Economic Survey produced by his team in the Ministry of Finance, is homegrown, universal but also budget neutral—meaning it would only roll out as other social programs were rolled back. As my colleague Justin Sandefur points out, the cost of universality is that the magnitude of any feasible transfer would likely be a small fraction of the $22 per month from the Kenyan experiment. It also means that the government has to find the money from its fiscal kitty that could be anywhere between 3.5 and 10 percent of GDP, depending on the magnitude of the transfer. But aside from the technicalities of the UBI debate, the key takeaway is this: getting out of poverty is a cognitive challenge, as Abhijit Banerji and Esther Duflo point out in “The Economic Lives of the Poor.” According to Dr. Subramanian, UBI can lead to the “liberation of the cognitive bandwidth” by providing the basic minimum level of support to people who really need it. And this bandwidth is no less important than its digital counterpart in shaping India’s new social compact.